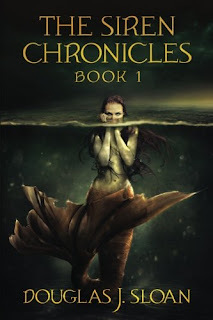 The Siren Chronicles: Book 1 written by Douglas Sloan, a world-renowned television and film writer, director and producer, working on everything from more than 200 episodes of the mega-franchise Might Morphin’ Power Rangers, to Dreamworks highly popular series Dragons: Riders of Berk. The Siren Chronicles follows marine biologist Elias Courtney as he leads the clean-up of the worst oil spill in California history. Courtney stumbles upon the unthinkable: a beautiful young woman named Lorelei washed up on the desecrated beach, tangled in the black seaweed, clinging to life. What would possess her to enter the black poisonous Pacific? And how long has she been under the water? As Courtney would soon find out — her entire life. In fact, this journey was the young mermaid’s first time on land. Lorelei, with companions Seanne and Millisine, has travelled a long way to walk these scarred shores. Now separated by the horrific oily mess that only humans could have caused, the three sirens must struggle to stay alive as they attempt to navigate this strange new world. They must reunite and begin the “Earthquest” -- their reason for being on land. Their underwater home is sick, dying off at an alarming rate. And whatever is causing the near extinction of the last remaining mermaid colony, clearly originated from exactly where they now find themselves. The Siren Chronicles is the exciting first installment in Sloan’s series of SIRENS books that will follow these miraculous young heroines across the globe, both above and beneath the ocean, as they try desperately to stave off a psychotic creature bent on destroying the planet, discover new species, battle old enemies, and face challenges they never could have imagined. I loved this book! I honestly thought it would be just another YA Science Fiction piece but I completely into the story of 3 mermaids who were schooled to come up and deal with the human's effects on their underwater home. They are part of the last mermaid colony and the oceans are a mess and something must be done. When the girls surface they are separated and we follow each individually until they meet up again and must work together to fight against a bigger threat than any of them originally thought. This is differently a must read and I cannot wait to see what happens in the next book.